If you are into trails, chances are you know the good ones - and what makes them special. Your input will be needed at a series of public and web-based workshops designed to capture the distinct features of the Coast to Coast Connector trail between December 2015 and March 2016. Thanks to the Tampa Bay Regional Planning Council (TBRPC) and the East Central Regional Planning Council, a Florida Department of Economic Opportunity grant has been secured to study opportunities along the entire 250-mile C2C corridor. Think trailheads, economic hubs, multimodal transit connections, cultural centers, and natural resources from the west coast to the east coast of Florida. Once inventoried, these resources will become part of a design overlay to guide construction of new trail segments and provide a unifying theme for existing segments. And yes, out of this effort will come a branding identity for the C2C. An image that resonates with stakeholders and establishes the tone for how the trail will be viewed by the public is needed to elevate 20 local trails into one world-class destination. The TBRPC is currently seeking a consultant for this project and the RFP is available online through October 23. Details on how and when you can participate in the workshops will be available on the TBRPC website. The project is expected to be finalized in June 2016. 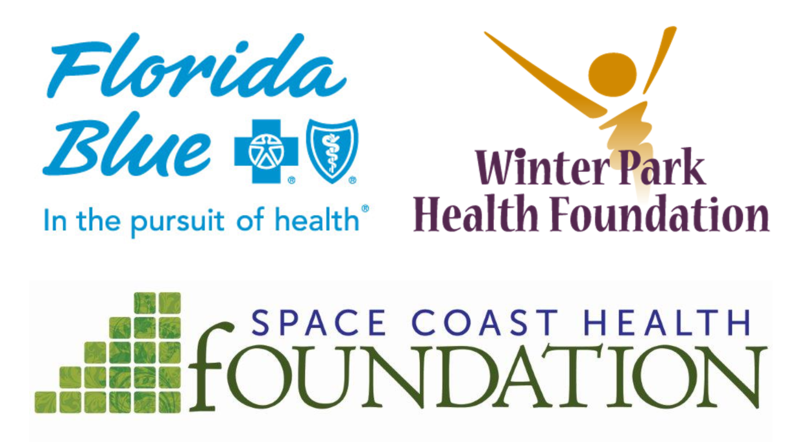 The FGTF looks forward to working with the regional planning councils, OGT, FDOT, the C2C Leadership Team and YOU to make the C2C the shining star of Florida’s system of recreational trails. Have a “must-experience” C2C place for us to feature? Email Coast2CoastConnector@gmail.com. No doubt part of the C2C’s appeal is hiking or biking to the sun-sational Florida coasts. But, don’t trek so fast across the state you miss the equally sun-sational jewel in the middle: the West Orange Trail. 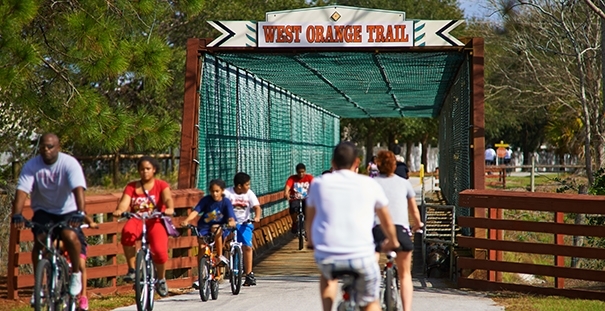 Between Apopka and Winter Garden in Orange County, the West Orange Trail is 20 miles of urban and rural delights that attracts over 150,000 people each month. Natural highlights include tree canopies, a butterfly garden, and the 128-acre Oakland Nature Preserve on the south shore of Lake Apopka. Keep moving and you will coast right through the middle of a bustling downtown Winter Garden, where you can grab a drink or bite to eat at a local restaurant or cool off at the splash pad. Horseback riders are welcome too, and can enjoy a ten-mile parallel equestrian trail north and south of Clarcona Horse Park. What you won’t see is the millions of dollars the trail has pumped into the Central Florida economy. 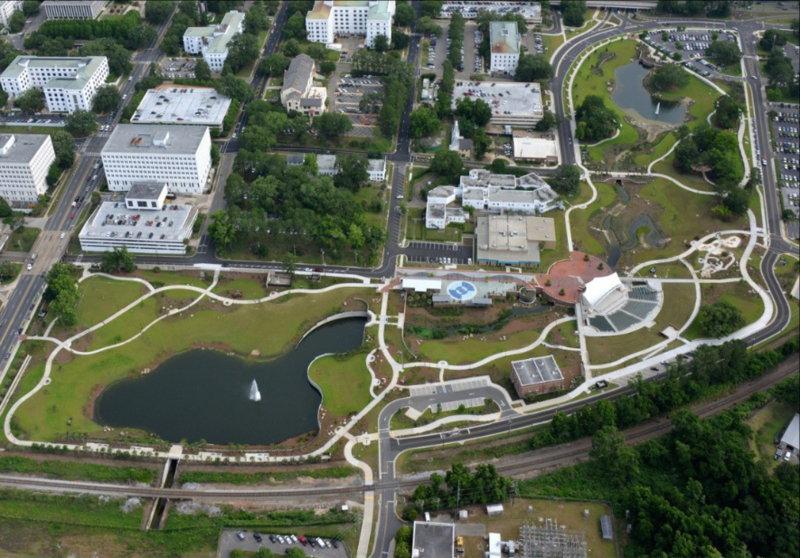 A phenomenal success story, the West Orange Trail has inspired cities and counties all over the state to incorporate a trail into their communities to spur revitalization and economic prosperity. This particular study may be a little dated, but the data says it all. The first Orange County Mayor, Linda Chapin, spearheaded the construction of the West Orange Trail in the 1990’s. She saw the trail as an opportunity to not only bring people to Orange County, but also link to neighboring Lake and Seminole Counties. 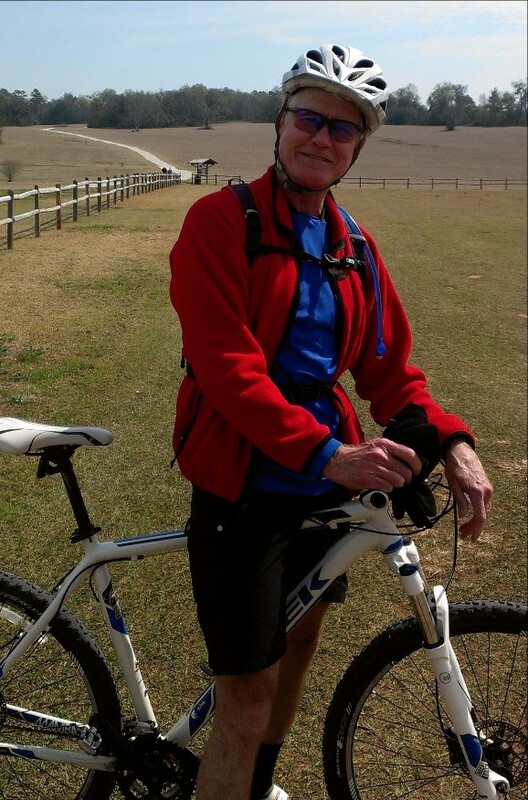 Still active in the trail community, she is thrilled to see the trail now link across the Sunshine State as part of the Coast to Coast Connector. Seventy miles of gaps. That’s what stands between you and a 250-mile stretch of paved paradise from the Gulf of Mexico to the Atlantic Ocean known as the C2C. But to close the gaps and create a world-class trail, a lot more is needed than pavement on the ground. We’re talking careful planning, thoughtful design and innovative engineering. To build a successful trail that has staying power, planners and engineers must pay close attention to each mile. 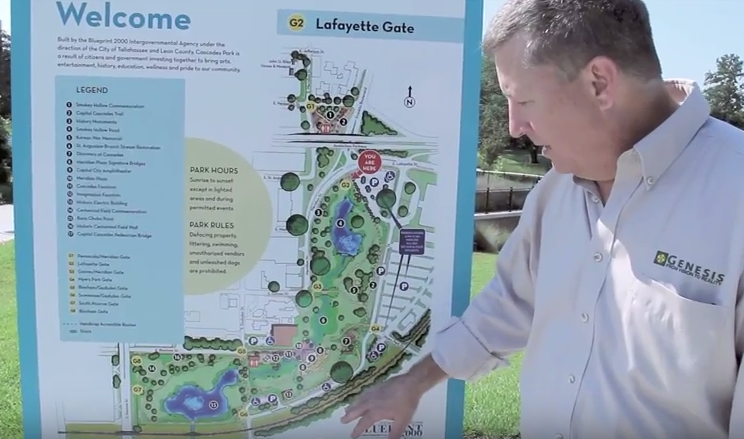 This includes engaging the local community for input, looking for opportunities to connect the trail to existing community resources like parks and recreational facilities, and celebrating and preserving historic components while reducing environmental impact. When done right, you create a destination that people flock to year-round (Pinellas Trail or West Orange Trail, anyone?). In other words, seventy miles of opportunity stand between us and Florida’s next world-class attraction: the C2C. 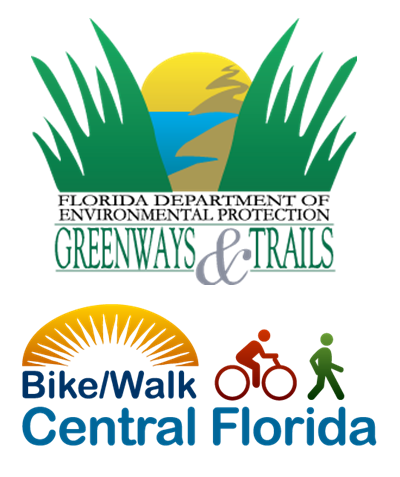 The Office of Greenways and Trails (OGT) hosted six meetings across the state in September to gather public comments on the Florida Greenways and Trails System Opportunity Corridors update. Over 200 individuals participated in the meetings and OGT received approximately the same number of comments. As stated in the Florida Greenways and Trails System Plan, these corridors represent the existing, planned and conceptual trails of statewide and regional significance and are developed in close collaboration with city, county and statewide partners. Corridors are meant to represent multiple recreational opportunities along an area, not all trails are considered an opportunity corridor. View the corridors at FloridaGreenwaysandTrails.org and email OGT Staff with comments before October 23. Seminole County will soon spend about $1 million in federal and county money to fill in a mile’s length of missing sections on the Rinehart Trail, which runs between north of Lake Mary and U.S. Highway 17-92 near the St. Johns River bridge. When the work is finished, bicyclists and pedestrians in Seminole County will have an uninterrupted paved pathway from State Road 436 in Altamonte Springs to near the St. Johns River bridge at the Volusia County line. Construction on filling in the four missing gaps on the Rinehart Trail will likely start in October and be completed in April, county officials said. Seminole’s trail network – including the Rinehart Trail – is also part of the 250-mile Coast to Coast Connector trail, or C2C, which will stretch from the Atlantic Coast to the Gulf Coast. Gov. Rick Scott was in a cutting mood after the state Legislature passed a $78 billion budget earlier this year, but one $25 million line item escaped his veto. Senate President Andy Gardiner inserted a change into how vehicle-registration fees are spent and siphoned off $25 million annually for what he called the Sun Trail program, or in plain speak, bike paths. 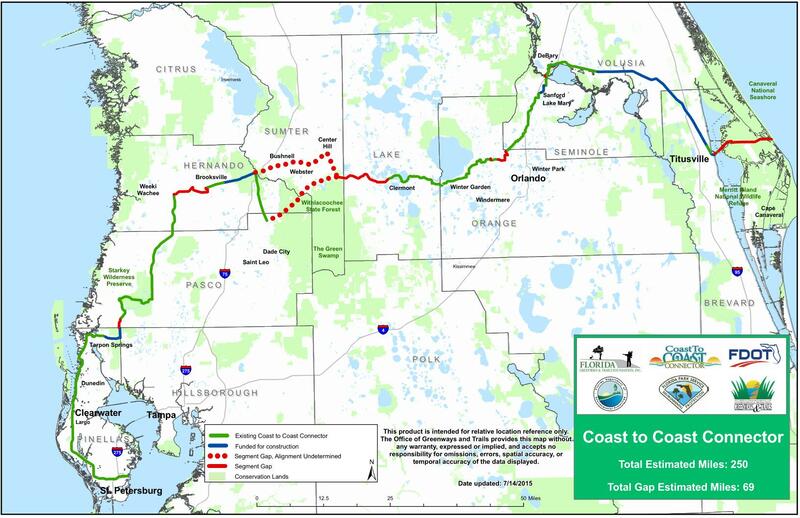 Some of the money could go toward the Coast to Coast Connector trail, a bike path that would link Florida’s east and west coasts. Gardiner said the coast-to-coast plan would be a perfect fit for the money he had set aside. Right now, nearly 70 miles of the proposed trail is missing, although a $3.6 million piece in Titusville was started in 2013. The estimated price to complete the trail is $50 million, though no one can be certain just how much it might cost until engineering and design studies are done. Bicyclists may soon have a path to Volusia’s coast after the County Council approved construction of the first trail that would connect the countywide network to the beachside. The council agreed to set aside $1.4 million for a 4.5 mile trail that will connect to Volusia’s East Central Regional Rail Trail and wind north through Edgewater and New Smyrna Beach. The connector would pick up where the county’s Regional Rail Trail leaves off at Park Avenue in Edgewater. The trail would go north through the Daytona State College campus in Edgewater, east on 10th Street and connect to Magnolia Street and head north to the North Causeway in New Smyrna Beach. Former Councilwoman Pat Northey, who championed trails during her time in office, said the extension could have major implications for the county, which is part of the Coast-to-Coast connector trail that when complete will stretch across the state from Titusville to St. Petersburg. She envisions bicyclists taking advantage of the many hotels and restaurants in Edgewater and New Smyrna Beach. A decision is months away. But much is at stake for whichever county secures the favor of the Florida Department of Transportation in choosing a 20-mile route for the Coast to Coast (C2C) Connector Trail. State highway officials anticipate completing a feasibility study in June 2016 on a northern route through Hernando and Sumter County or a southern route through Pasco and Sumter County. Sumter County is the only sure winner in the construction of a major segment of the planned 275-mile trail that will link the state’s east and west coasts. The city of Webster in Sumter County and Dade City, the Pasco County seat, are separated by 24 miles, but connected by a burgeoning political squabble – over bicycles. The dispute centers on a portion of the Coast-to-Coast Connector Trail from St. Petersburg to Cape Canaveral. One of the largest gaps in the 250-mile route is the 20-mile portion known as the South Sumter Connector, linking Hernando, Pasco, and Sumter counties between the existing Withlacoochee State Trail and the Gen. James A. Van Fleet Trail. The state Department of Transportation is evaluating two potential paths, a northern route that would go right through Webster and a southern route that would include Trilby and run parallel to County Road 575 before leaving Pasco County. It will take more than a show of hands to figure out the best route. Wetlands damage, rights-of-way acquisition costs, proximity to hunting areas and access to emergency services are some of the other contributing factors. Webster and Dade City officials are anxiously awaiting a feasibility study to select the best route for the only yet-to-be-decided section of a 250-mile-long trail connecting the Atlantic Ocean to the Gulf of Mexico. One of those two cities will be left out in the cold. The Coast to Coast Connector will link 19 state, regional and local trails in nine counties, including Lake and Sumter. The trail is pretty much cut and dried with identified gaps between existing trails except in Sumter and Pasco counties. Here, two different alignments are being looked at from the western end of the South Lake Gap ending at Villa City Road near Groveland. One alignment would head north from the Lake/Sumter line to Center Hill and Webster to link with a proposed trail headed to Brooksville. The other alignment would run from the Lake/Sumter line to Zephyrhills and to Dade City to link with the trail headed to Brooksville. Two more Coast to Coast Connector workshops are planned next year before officials complete the feasibility study – looking at engineering factors, potential environmental effects and financial costs – in June 2016.